Gardeners often use landscape plants to add color, borders or ornamental interest to landscapes. Colorado falls within United States Department of Agriculture (USDA) Hardiness zones 2 to 7. Colorado gardeners should select landscaping plants according to appropriate hardiness zone, flower and foliage color, mature size, general culture and intended use. The Rocky Mountain maple (acer glabrum), a member of the aceraceae plant family, grows well in elevations ranging from 5,000 to 10,500 feet. Mature maples grow to 30 feet tall with spreads of up to 15 feet. This small tree features a round crown, red twigs, smooth bark and non-showy, red flowers that bloom in April and May. The green leaves turn yellow, orange or red shades in the autumn. This cold-hardy perennial prefers moist, rocky soils in sunny positions. Rocky Mountain maples work well as landscape trees. 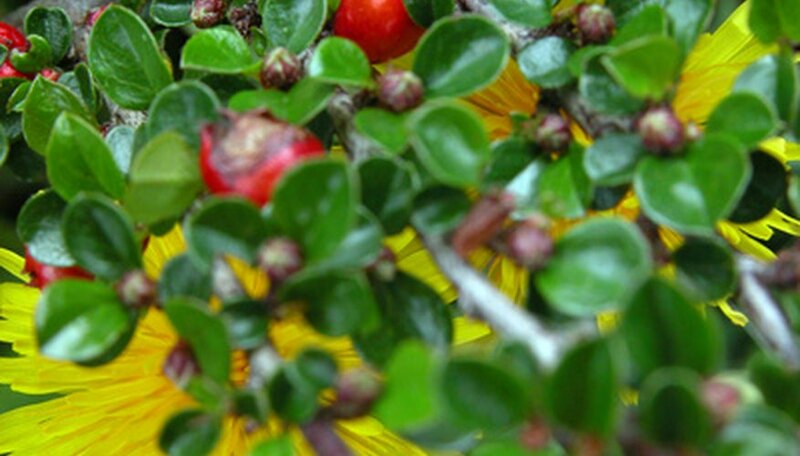 The rock cotoneaster (Cotoneaster horizontalis), a slow-growing shrub in the rose family (rosaceae), reaches 2 to 3 inches in height and spreads of 6 to 8 feet. Small, pink flowers bloom from May to June, giving way to bright red fruit that ripens in late summer. Deep green leaves turn red to purple in the autumn. Rock cotoneasters like loamy, moist soils in partial to full sun locations. This plant tolerates poor soil and drought conditions. Colorado gardeners often use the rock cotoneaster for ground covers and rock garden accents. The blazing star (liatris punctata), sometimes called the gayfeather, is a perennial plant in the daisy family (asteraceae). This plant grows well in areas reaching up to 7,500 feet in elevation. The blazing star blooms from August through October, featuring flower spikes covered in purple or pink blossoms. Its stems reach up to 2 feet in height. This plant prefers sandy, well-drained soils in full sun locations. Colorado gardeners often use the blazing star in containers and butterfly gardens. The mountain love plant (paxistima myrsinites), sometimes called the myrtle boxwood, belongs to the celastraceae plant family. In Colorado gardens this low-growing shrub reaches 8 to 12 inches in height and 15 to 20 inches in width. Mountain love plants feature evergreen leaves and non-showy, maroon flowers. This shrub needs rich, well-drained soils in full shade to full sun locations. Mountain love works well as a hedge and an edging plant. The Colorado spruce (picea pungens), Colorado’s state tree, thrives in cool climates. Also called the blue spruce, this tree features pale brown pine cones, deep gray bark and a pyramidal shape. Its needle-like leaves are green, blue-green or blue-silver in color. This spruce naturally occurs in Colorado foothills and mountains from 4,000 to 9,500 feet in elevation. Mature trees reach 60 feet in height and 20 feet in width. Colorado spruces prefer acidic, well-drained soils in full-sun locations. This spruce variety sometimes suffers from needle cast and spruce gall aphid infestations. The Colorado spruce works well as a landscape specimen.